The west side of Evans Street in Amherst, south of Sheridan Drive, has become an epicenter for ethnic delights. It’s home to Spices of India, 438 Evans St., my favorite Indian buffet in Western New York and a connected grocery. One plaza south is Thai Orchid, 416 Evans St., which might have the best Thai cuisine in the area, and Korea House, home to the area’s only tabletop-cooked Korean barbecue. Now there’s The Pita Place, a Lebanese counter-service restaurant with shawarma, falafel, and house-made pistachio baklava, at 412 Evans St. The owner, Elie Harfouche, said he makes everything himself, including the yogurt he turns into lebneh, the thick, tangy Middle Eastern spread. The restaurant has taken unusual pains to identify the gluten-free and vegan options on his menu, and they are legion. The place is open 10:30 a.m. to 8 p.m. Monday through Friday, 11 a.m. to 5 p.m. Saturday, closed Sunday. Here's the skinny: this place gets Middle Eastern fundamentals right. The Lebanese standards (babaganoush, hummus, tabouli) here are full-flavored, with more lemon and garlic than I'm used to getting. Also noteworthy: Harfouche uses good, fruity olive oil, and lots of it. The fattoush, salad with pita chips, got the toasty chips right for a change, although there could have been more of them. Tossed just before serving, this was a bracing salad dressed with lots of lemon, good olive oil, and sumac for even more tang. The falafel delivered lots of texture but still managed to be relatively light. Lots of bean nuggets and herbs inside. Falafel fanatics should swing by and see how this place measures up to their standards. The kibbee was not that exciting by itself, despite a breath of allspice. Treated as a Lebanese hamburger, wrapped in pita and dabbed with some of the zippy hummus and salad for eating out of hand, it was delicious. 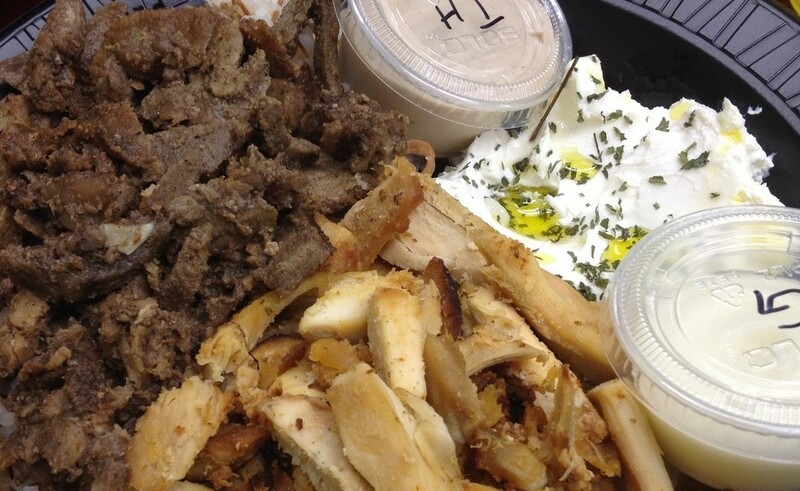 The shawarma was a split decision. I enjoyed the beef version enough to eat far more than I should've. It was moist enough and well seasoned. The chicken version was seasoned, but dry, with some bits chalky. I ate it anyways, because once I dunked it in the beguiling garlic aioli, or the dense, rich lebneh, I was pretty much defenseless. This could happen to you, so a word about the aioli: Eat it with someone you love, or be prepared to sleep alone. The garlic fumes are significant. The rice was also well done, by the way. Lebanese baklava is less sweet and sticky than its Greek counterpart, generally speaking. Harfouche's tasted like butter and browned pastry and nuts, before the sweetness kicked in. It was outstanding. I've heard complaints about the time it can take to get food at The Pita Place. We were the only customers the night we visited, so I don't have any relevant information about that. Based on my meal, I would suggest that if you have to wait, it will quite likely be worth your time. This is the first time I've ever seen a "Buffalo style" falafel offered. Why not?